There are immeasurable rewards to being a mother in spite of the infinite challenges parenthood has to offer. For every sleepless night, anxiety, frustration, messy house, spit or puke stain on your clothes and simply being exhausted to the bone, there is the deep joy, as well as the kind of love you never thought possible that continue to make you evolve into a better human being. Indeed those are priceless gifts to be treasured, all thanks to motherhood. But that's not what I'm here to talk about. Beyond what I expected to get out of this amazing role and identity, there are a few things that took me by surprise—realizations, lessons or transformations that I didn't think would touch my life as I became a mother. I look at my son—the shape of his cheeks, his hair, the feel of his skin, his height, the way he walks, tells his stories, plays with his toys and interacts with other people—and always ask myself only one question: Where did the time go? Every mother I know echoes the same sentiment and for a split second you see in our eyes that wistful look. I am proud of my son and always grateful that I came out still relatively sane after the most difficult first 3 years of motherhood. He is no longer that colicky baby, the needy toddler, or as fragile as any young child is when it comes to illnesses. He is now so much more mature, more independent, very well-disciplined and less shy around friends. So much has changed, some easier than before, while others are more complex. And though I see how far we've come, I can't help but wish time didn't move as fast sometimes. Often times I find myself looking at old photos and watching family videos from the past and as my heart melts with every shot and scene, I know that the only lesson is for me to not take any moment for granted. Time flows independent of our desires and the kindest thing we can do for ourselves, especially as mothers, is to be fully invested in every second. Savor it. Be present. Capture the experience, not with lenses, but with your heart. With every motion time makes, it carries with it possibilities pregnant with change. We can never tell which ones are consequential, although I have learnt that in a mother's eyes, every slight change, every inch gained in height, every slight change in hair color, voice tone, scent and temperament are worth cherishing. Dealing with people outside of one's comfort zone is never easy for an introvert like myself. If you only knew how much effort I put in and how exsanguinated I could feel after a simple phone call with a bank or credit card employee, you would wonder how I've managed all these years fulfilling my mom duties. But that's the beauty of motherhood. It will make you realize that you are the first and foremost advocate for your child. You are a Mama Bear and no one can mess with you where it comes to your child's well-being. Somehow, motherhood infuses us with a 'can-do' spirit, activating that side of us that has no choice but to do what is necessary when it comes to making sure our child is safe and well. I have no issues talking with doctors, asking anything I need to ask when it comes to illness or medication. I have no issues with school personnel, as long as I know I'm not violating any boundaries and not seeking any special treatment. I am still an introvert, very reserved when dealing with others and certainly never confrontational. But I also know that motherhood made me grow claws, ready to come out when needed. I have always been aware of my perfectionist tendencies and have been casually labeled by friends and family as having borderline OCD when it comes to organization. 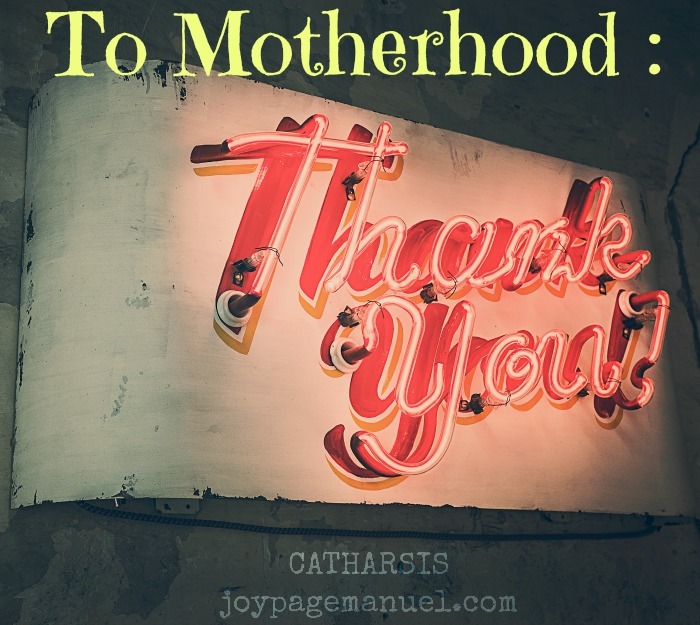 Motherhood transformed that side of me. Though I still demand some organization for my sanity's sake, I also now concede that there is perfection in every situation, no matter how chaotic. There is no one system that can work for every family, in every situation. Sometimes you have to let your idea of perfection go in order to experience life more deeply. People are more important than things; laughter and fun more than perfectly sorted toys, remote controls and crayons. And though I still believe in the power of scheduling, I no longer chastise myself for not sticking to one day in and day out. I can't be controlled by blocks of time telling me when and what part of my house to clean each day when I know that my family needs me to be present for them, as well as my personal work and creative side calling out for my attention. I now know that things always work themselves out somehow and that life is perfect even with the bumps and wrinkles we encounter along the way. I always say that I don't know how my Mom did it all. She worked full time and yet took care of 3 children. She woke up at 4 a.m. every day to make sure we had a good breakfast before heading out the door. She and my Dad were also out the door by around 6:30 to go to their respective office jobs. We never felt neglected, and I would say that we had a happy and healthy childhood. But to say that my Mom did it all by herself is also only half-truth. Apart from having my Dad, for a few years when we were still very young we had house help (or a 'maid' as some would call it). Most importantly, we grew up in a duplex with my Aunt (Dad's sister) and her family living right next door. My Aunt was a stay-at-home mom and so she was always there to keep an eye on us. Eventually when we no longer had house help, it was my Aunt who really watched over us whenever needed. This is also why now that I'm living in the U.S., I still find the concept of hiring a baby sitter quite foreign to me. Filipinos are very family-oriented and we are used to relying on extended family for help. There is always an aunt, uncle, grandparents or cousins you can call if you need someone to watch your kids for you. I don't have that now and relying on a complete stranger to watch my son is so scary and alien to me. This is why I fully appreciate the idea that it does take a village to raise a child. Doing EVERYTHING by your self ALL THE TIME is quite impossible. You need family, friends, neighbors, and trusted institutions to assist you with your children. Asking for help is never easy for anyone but parenting assumes dependence on others. It is a vulnerability that's just part of the job description and is not necessarily a bad thing. Last but definitely not least, my own motherhood definitely takes me back to my Mom and how she was and still is a mother to us. Do you remember how we all hated it when our mothers used to tell us, "Oh you'll understand all this when you become a mother yourself"? To me it wasn't just because it was a withholding of information. It also felt like a threat and a curse. But it's all true. Things I disagreed with or hated when I was a child are things I now see as necessary and find myself doing as well. The strictness, the need for structure, the discipline—I've reaped the rewards of all that and want the same for my son. I consider myself one of the very fortunate ones for having good role models and an amazing, strong, intelligent woman for a mother. I am eternally indebted and just hope with all of my heart that I am making my Mom proud with how I've turned out as a mother, and that she feels I am honoring her with all the right choices I make now, not only as a parent, but as a human being. Motherhood is a privilege I will unceasingly be grateful for. It has enriched my soul in countless ways and the lessons just keep pouring in. It is such a tough, all-consuming job and the rewards are there, just not always in ways you'd expect. But thank you. Thank you, Motherhood, for all your gifts whether packaged attractively or not. I receive them with an open heart and wish that all mothers everywhere embrace you with pride and the courage to claim your gifts. Such a great post Joy, and I agree with everything you wrote. I think the one I'm feeling the most poignantly right now is the appreciation for time. My son's senior year has gone faster than I ever imagined possible, and in only 3 months I'll be taking him to college. Where did the time go? So important to savor the moments, big and small. Hope you have a wonderful Mother's Day!